And she let down her hair, and the King’s son climbed up by it. 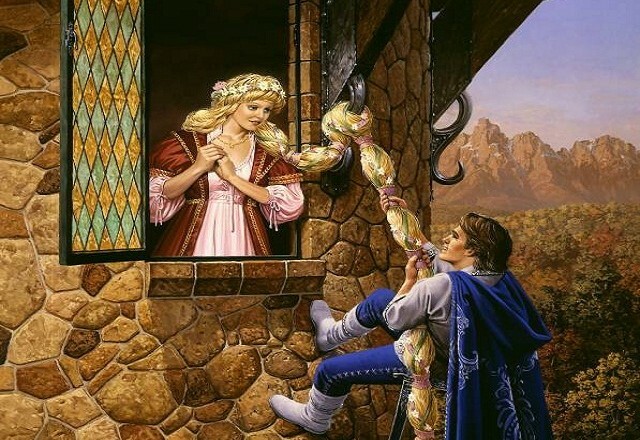 Rapunzel was greatly terrified when she saw that a man had come in to her, for she had never seen one before; but the King’s son began speaking so kindly to her, and told how her singing had entered into his heart, so that he could have no peace until he had seen her herself. Then Rapunzel forgot her terror, and when he asked her to take him for her husband, and she saw that he was young and beautiful, she thought to herself, “I certainly like him much better than old mother Gothel,” and she put her hand into his hand. She said: “I would willingly go with thee, but I do not know how I shall get out. When thou comest, bring each time a silken rope, and I will make a ladder, and when it is quite ready I will get down by it out of the tower, and thou shalt take me away on thy horse.” They agreed that he should come to her every evening, as the old woman came in the day-time. “O wicked child,” cried the witch, “what is this I hear! I thought I had hidden thee from all the world, and thou hast betrayed me!” In her anger she seized Rapunzel by her beautiful hair, struck her several times with her left hand, and then grasping a pair of shears in her right – snip, snap – the beautiful locks lay on the ground. And she was so hard-hearted that she took Rapunzel and put her in a waste and desert place, where she lived in great woe and misery. Then she let the hair down, and the King’s son climbed up, but instead of his dearest Rapunzel he found the witch looking at him with wicked glittering eyes. “Aha!” cried she, mocking him, “you came for your darling, but the sweet bird sits no longer in the nest, and sings no more; the cat has got her, and will scratch out your eyes as well! Rapunzel is lost to you; you will see her no more.” The King’s son was beside himself with grief, and in his agony he sprang from the tower: he escaped with life, but the thorns on which he fell put out his eyes. Then he wandered blind through the wood, eating nothing but roots and berries, and doing nothing but lament and weep for the loss of his dearest wife.